of delivering creative lessons to the different ages. However, the most rewarding part for her was working with the GCSE and A-level students, where she developed an expectation for hard work combined with a sense of fun and enthusiasm. Lunchtimes saw the Art rooms packed out with students, not just when it was raining! it was always a popular destination for her Art study visits, although the most memorable trip was seeing the sell-out Alexander McQueen exhibition at the V&A. The Art trips were always popular and Mrs Brown was proud of the way Hymers students went into galleries and immediately started drawing. Fantastic! The best thing about working at Hymers for Mrs Brown was the camaraderie of the staff and the enthusiasm of those students who loved Art as much as she does. She has taken early retirement to explore other opportunities with her own ... and to go for long walks on the beach! led her also to begin teaching drama as this allowed her to teach the two things she loved most. 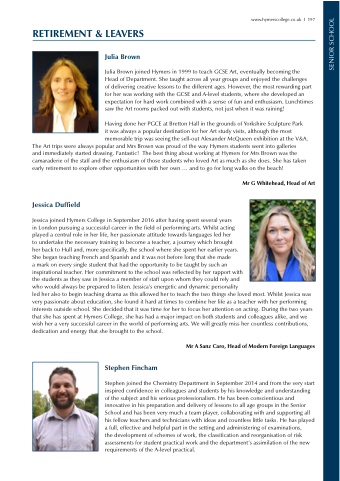 Whilst Jessica was very passionate about education, she found it hard at times to combine her life as a teacher with her performing interests outside school. She decided that it was time for her to focus her attention on acting. During the two years that she has spent at Hymers College, she has had a major impact on both students and colleagues alike, and we wish her a very successful career in the world of performing arts. We will greatly miss her countless contributions, dedication and energy that she brought to the school. the development of schemes of work, the classification and reorganisation of risk assessments for student practical work and the department’s assimilation of the new requirements of the A-level practical.